Steel Champions is a game that brings boxing, in a first person perspective, to your Windows Phone. The game has a Japanese Anime feel to it with nice graphics and animations. The boxing matches are fast paced and challenging. However, a somewhat muddlesome user interface may hold this game back. With Steel Champions you play the role of Max who must fight his way through 14 challengers and win three titles. The main menu for Steel Champions is an interface with your boxing engineer, Dr. Kinoshita, and has options to talk, enter the training room, visit your manager and access the games options. The talk option gives you a little background information on you and the game itself. Options for Steel Champions cover music on/off, vibration on/off, choose the background music and reset the game. The training room acts more as a tutorial with a punching bag that will walk you through the fight controls. The Manager option sends you to Katsuko, your fight manager. From the Manager screen you have options to talk to Katsuko, view your opponent's information, return to Dr. Kinoshita (the Engineer) and jump into the ring and fight your opponent. When you decide it's time to step into the ring, the game takes you through a series of story boards while the game loads. Game play has you facing your opponent with left/right punch controls on the right of the screen and a joystick to control movements and the direction of punches (head, body, etc.) to the left. Yours and your opponents vitals are up top and the round timer. As you punch your opponent into smithereens, a super punch button will appear that gives your punches a little more sting. Unless you've turned it off in the Options Menu, your Windows Phone will vibrate every time your opponent lands a punch. Should you get knocked down, you'll need to frantically tap the punch buttons to get back up. Get knocked down enough and no matter how quick you tap the buttons you won't get up. Robots on the other hand often jump back up quickly after the first knock down but I've yet to see one survive the second knock down. When the robots are down for the count, you'll get a Congratulations screen detailing the fight time and how it effects your ranking within the game. For the most part, Steel Champions is a decent game with nice graphics and fast paced game play. Stand still for too long and you'll get pummeled by the robot fighters. But the game plays more as an arcade game that's missing an addictive hook to it. I would have rather seen Steel Champions laid out more as a RPG game where you could upgrade your boxer's abilities or skills as you advance through the matches. The user interface is also a little awkward in that once you tap an option to pursue, you get dialog from either the Manager or Engineer and then have to hit a "Go" button. I think the game would be a lot smoother if the UI had a smoother flow. Steel Champions has potential, it just needs a little fine tuning. There is a free trial version for Steel Champions to let you try things out before buying. 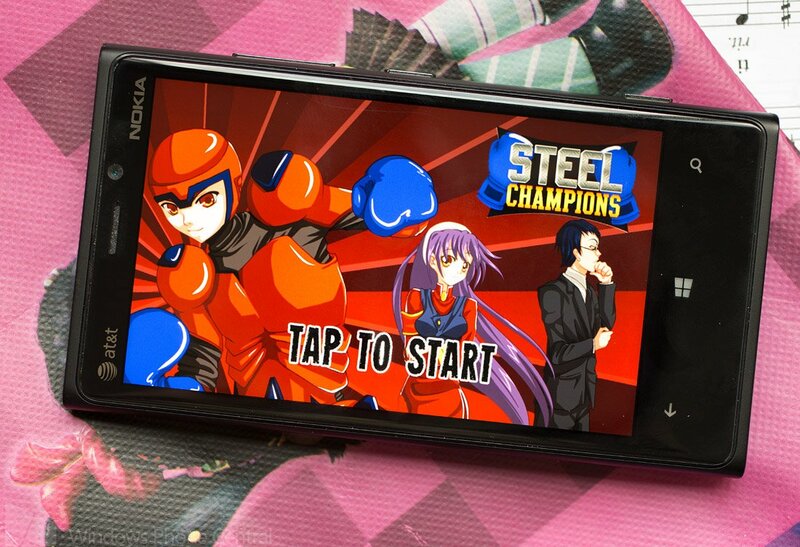 The full version is currently running $.99 and you can find Steel Champions here at the Windows Phone Store.